The YI Outdoor Camera has a great set of specs, features, and customization settings, but mixed user reviews regarding performance make us a little wary of this relatively new camera. Dimensions: 2.7 x 2.7 x 5.2 in. A good camera is key to a solid home security system, and an outdoor camera is the first line of defense for your home’s perimeter. Whether or not you are familiar with the YI camera brand, all of the YI cameras are excellent; in fact, the YI Home Camera 2 is one of our top-ranked security cameras on a budget and IP cameras. The YI Outdoor Camera is a newcomer to the YI family and is the only one meant to be mounted outside and able to withstand all kinds of weather. But does it live up to the YI reputation? Read on to find out. The YI Outdoor Camera performs well compared to other outdoor security cameras in terms of specs and features. The camera has a resolution of 1080p HD, but with only 20 fps (frames per second). That’s a little lower frequency rate than we’d like, though still enough for a clear picture. It has a 110° wide-angle FOV (field of vision), which, though not as wide as many indoor cameras, is typical for an outdoor camera and will give you a good view. It also comes with two-way audio, allowing you to hear what’s happening and communicate with anyone on the other end. Some users have reported a crackling sound in the audio that makes it difficult to use, but most have not had a problem. Probably the top advantage of the YI Outdoor Camera is that it costs much less than several similar outdoor cameras. The YI runs at just around $100 or less, whereas competitors like Nest and Blink hover in the $200 to $400 range. If you’re looking to buy more than one or just need something cost effective, this might be the right choice for you. Because the YI Outdoor Camera is meant to be out in all kinds of weather, it is water resistant and completely dustproof with an IP (Ingress Protection) rating of 65. The YI Outdoor can withstand temperatures as low as 5°F and as high as 122°F. This should be a sufficient range for most climates, but if you live in a location that regularly sees temperatures beyond that range, you’re better off with a security camera that can withstand extreme cold or extreme heat, like the Amcrest ProHD Outdoor camera. One of the great things about the YI Outdoor Camera (and something that lots of users mention) is that setup and installation are quick and easy. Once you have downloaded the mobile app, you simply need to plug in the camera and connect it to your device on the app. The camera uses a 2.4 GHz Wi-Fi connection and will need a strong signal in order to communicate effectively with your phone. The camera comes with a mount that can pivot to any angle, but you cannot pan, tilt, or adjust the camera view from the app except to zoom in and out. This gives you fewer options than an indoor camera that can pan, tilt, and zoom, but this limitation is typical for an outdoor camera. Another thing to note is that the power cable is only about 10 feet long, which may limit your placement options, so keep a power source in mind when you mount the camera. The free YI Home app gives you access to the live video feed from up to 12 cameras (though you can view them only one at a time). From the app, you can access the two-way microphone, record a video, and take a picture (which will be saved to your smartphone). The app is available for iOS and Android devices, but note that Windows phones are not supported at this time. You can also download the app from the website onto your PC or Mac OS to view the camera feed on your computer. One note to mention is that the video has to be refreshed every 30 minutes. This frustrates some users, but if you only check in periodically, it shouldn’t be a problem. You can share the live camera feed with up to five different people, and on a computer you can view up to four live feeds on one screen. An aspect we really like about the YI Outdoor Camera is that it gives you customized settings options. For example, you can turn the motion detection on or off. You can set a specific alert area—for example, the front porch—to alert you when motion is detected only in that area instead of anywhere in the camera’s view. You can also adjust the alert sensitivity and set up to three time periods when you receive alerts (for example, you can choose to receive alerts during work, while you’re home, or at night). In other words, you can get notifications only when you want them. One of the more divisive features of the YI Outdoor is that, unlike other outdoor cameras, it has a deterrent alarm. While we like that this option exists, we don’t like that it’s motion-triggered and can’t be operated manually; either it is on and goes off for every detected motion or it is completely off. Many users found they had to set the sensitivity to low so the alarm wouldn’t sound constantly. Night vision quality is an important aspect of any security camera—and it’s even more crucial in an outdoor camera. 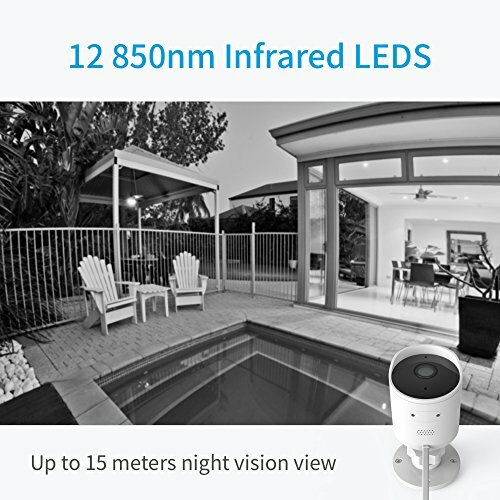 The YI Outdoor Camera is equipped with night vision with an automatic color switch filter in low light. The night vision is not quite as powerful as some competing cameras with only 12 infrared LEDs (850nm each), but it is sufficiently clear for an advertised viewing distance of up to about 50 feet. While this might not illuminate your entire yard, it should be enough to see the area immediately around your home. For more information on what makes a great night vision camera, check out our best night vision cameras article. One of the biggest drawbacks to YI cameras is that, while they integrate with other YI cameras, they do not integrate with any third-party home automation hubs or home security systems. This makes them a little less convenient to use when you have additional devices and you’d like to control them from one place. However, YI cameras are still high-quality, excellent choices, especially if you use several YI cameras to watch over your home from one app. If you are looking to install a more comprehensive security system though, we’d recommend other options. The YI Outdoor Camera has a micro SD card slot (8GB to 32GB) for recording video, but you also have the option of storing videos on YI Cloud. Using an SD card is a great way to save money, but in order to pull the recorded video from the card, you’ll have to remove the card from the camera. Depending on where the camera is located, that could be difficult or at least inconvenient. 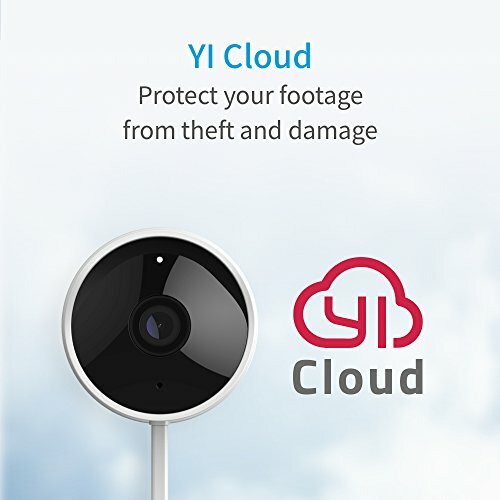 The advantage of using the YI cloud service is that your recorded videos are available anytime and are therefore much easier to access. It also gives you unlimited video storage space, whereas a 32GB SD card can hold only about four days of video before it starts recording over. However, YI Cloud does require a subscription. Prices range from $9.99 to $19.99 per month, and all new users get a one-month free trial to start. You can choose between a Standard and Premium plan and select how many days are stored at a time. Both the cloud and SD card use loop recording, so when it reaches capacity, it starts recording over the oldest footage. The Standard and the Premium plans differ in that Standard plans support up to five cameras, whereas the Premium plans support only one camera at a time. Another difference is that a Standard plan saves only motion-detected videos, whereas a Premium plan records 24/7. This might not be a problem except that as of now, the camera records up to six seconds of motion detection at a time. This is potentially unhelpful and something many users dislike about the camera. Every time we reached out to the YI customer support team, we were pleasantly surprised at how quickly we were helped and with the quality of service. When we filled out an online form with a question, we received an emailed reply within 30 minutes. There was no wait time to speak to someone on the phone, and all of our questions were answered in a clear, friendly way. When we asked specifically about the YI cloud service, the representative took time to explain the advantages of the cloud service and an SD card without trying to sell us on one or the other. Overall, it was a very positive experience. More customers report positive experiences with the YI Outdoor Camera than negative, but reviews are mixed and sometimes contradictory. Common complaints include problems with the micro SD card, the power cord being too short, a crackling sound over the microphone, and poor picture quality. Conversely, the positive reviews often mention how pleased consumers are with the quality of the video picture, the ease of setup, and the variety of features and settings. While we recommend using a monitored home security system with great cameras, we understand that that won’t work for everyone. The YI family of cameras are great cameras, but the YI Outdoor Camera isn’t quite up to par. We love the options to customize when you receive alerts and the built-in alarm, as well as the inexpensive price tag. However, there are other cameras that seem to perform more consistently and we recommend exploring all options before settling on the YI Outdoor Camera. It might be exactly what you need, but you’ll want to be sure that the features and settings outweigh other inconveniences. 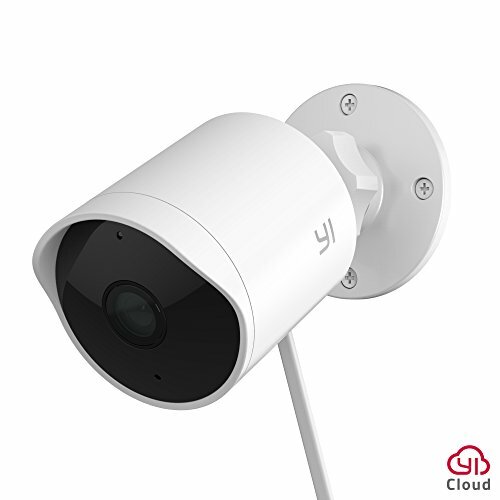 Have you tried the YI Outdoor Camera? How does it compare to the competition? Tell us about your experience in the comments below.